The Cambridgeshire 3,000m County Championship at St Ives provided Nene Valley Harriers ladies with rich pickings last week. Star billing went to 15 year-old Josephine Fortune who won Under 17 gold with a personal best 11:05.99. Nicky Morgan picked up a bronze medal in the senior ladies race. The Hampton-based speedster flew round in a time of 11:08.62, her fastest run over the distance for 11 years. Fellow Harrier Katie Tasker won the Under 15 silver medal in an impressive 11:23.27. The Nene Valley men were not so successful. Jevan Robertson, Michael Channing and James Macdonald all ran well but missed out on podium places. Thirteen year-old Peterborough AC youngster Harvey Hancock finished fifth in the Under 15 race. Eighteen year-old Alex Hampson travelled to Watford to take part in The British Milers Club Grand Prix meeting on Saturday and had a tremendous run, taking over three seconds off his previous fastest 1500m time as he crossed the line in third place with a 3:56.25 clocking. Megan Ellison was less than a second off her PB in the 800 metres finishing fourth in 2:14.77. Cambridgeshire 800m and 1500m gold medallist Daniel Mees of Peterborough AC finished sixth in his 800m race with a time of 1:56.16. Nene Valley’s James McCrae is best known for his long distance prowess but proved that he is no slouch when it comes to shorter distances at the Corby Open meeting. The Birmingham University student, coached by legendary veteran American Bud Baldaro, clocked 24.9 in the 200m and 54.0 in the 400m. Georgie Ivens won the ladies 400m in 59.8 while Nichola Gibson of Peterborough AC finished fifth in the same race. Peterborough’s Jess Varley was 10th in the ladies 1500m in 4:57.6, and was just one position ahead of talented Nene Valley youngster Flo Brill. A group of Nene Valley Harriers winged their way to London on Bank Holiday Monday, joining over 11,000 other runners on The Mall for the start of the Vitality London 10,000m Road Race. The course took in many of the capital’s most popular sights, but this was not a time for sight-seeing as the wide roads and cool temperatures made for perfect racing conditions. Micheal Channing was the first Harrier home finishing 123rd in a time of 34:17. This represented a huge improvement on the 26 year-old’s previous best. Chris Wright crossed the line a minute further back in 177th position, and Lee Harthill was next home in 324th place with a personal best time of 37:08. Fifty year-old evergreen Sean Beard was delighted to finish in 37:45 as he continues his comeback from injury. Andrew Dickens squeezed into the top 500 with a 38:40 clocking with Paul Holden finishing two minutes further back. Veterans Yvonne Scarrott and Barry Warne just missed out on top 1,000 placings, but both finished 16th out of several hundred in their age groups. 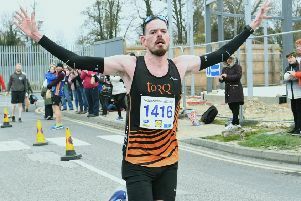 Peterborough AC’s James Sadlier clocked a time of 38:17 while Werrington Jogger Martin Stevens ran his fastest 10,000m road race for 11 years in 37:56. The Peterborough 5k Grand Prix Series kicks off at the Watersports Centre in Ferry Meadows next Wednesday (June 8). All the races commence at 7:30pm with a junior 3k race starting at 7pm.Entry fees for the 5ks are £5 for affiliated athletes and £7 unaffiliated. All 3k entrants pay £3. There will be prizes across all categories. 3 August - Werrington Sports Centre.